The monument of Aircraft Replica seulawah RI-001 is the monument of the real first aircraft that purchased by the State of Indonesia, with financial support from all the people of Aceh who voluntarily collect funds to buy this aircraft. In addition, this aircraft has an important role in the early days of independence as well as the history of aviation of Indonesia. 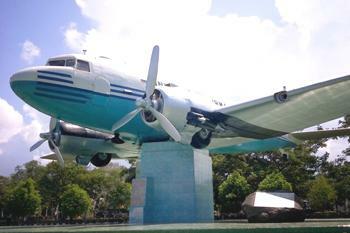 The monument Aircraft Replica seulawah RI 001 is located on the Blang Padang ground, Baiturrahman sub-district, Banda Aceh; it takese only 1 kilometer from the center of Banda Aceh. To go to this monument, visitors can use public transport in the city, the local used to call this transportion as labi labi. The construction of the monument was first coined by the Air Force, for the intended to commemorate the services of people of Aceh who have voluntarily collect their possessions to finance the purchase of these aircrafts. After the completion of the development process of this monument, the construction was inaugurated by the Armed Forces commander General L.B. Moerdani on 30 July 1984. The aircraft used to have a code HEC VR aircraft, after it was bought and taken to Indonesia, the Indonesian first President Soekarno rename the plane into Seulawah, which means The Mountain of Gold and it transformed into a registration code RI 001. The fuselage has a length about 19 meters with a length of 28.96 meters and both wings has two engines of Whitney and Pratt , with weight of 8030 kg. The aircraft was able to fly at speeds of 346 km / h.
There are three replicas of aircraft that made by Indonesia, the first one is located in Blang Padang, the second one is located in Taman Mini Indonesia Indah in Jakarta, precisely around the bridge of Aceh and the third is located in the State of Myanmar, precisely at a museum called museum Rangoon. This place is always crowed by the visitors, especially in the morning and afternoon. With the public facilities made by the government of Banda Aceh, people can use it for free. Moreover, the visitors can also enjoy the nuance by hanging out around the stalls or shelters around the monument.